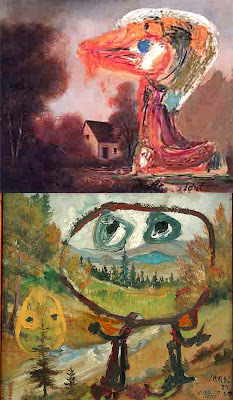 I'm considering going back to about 5 or 6 paintings from 2005/2006 and doing some Asger Jorn type renovations. I guess the work has just been sitting around for too long and I wan't to have some fun with it. I'm not that attached to it.. I'm not one of those people who horde things or cling deparately to sacred objects. Process is more fun. Objects are death. People who sell or make objects are morticians. People who talk about Darfur are celebrities. People who have no healthcare are my neighbors. The CoBRA group would be proud.